And the winner goes to…….Georgia of course! Not only is our great state an amazing place to live, it also pumps out some of the most amazing musicians in the world! 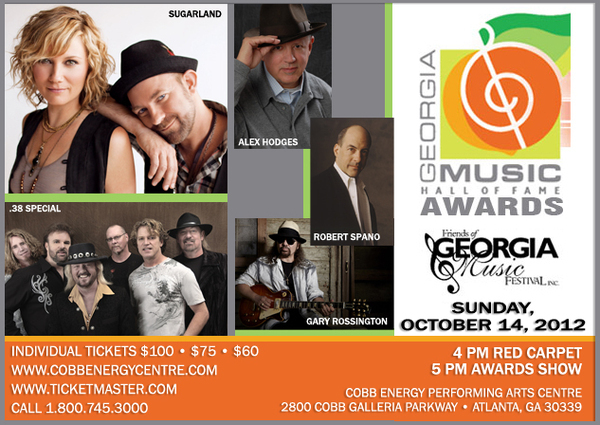 The 34th Georgia Music Hall of Fame Awards Show and Concert is scheduled for Sunday, October 14 on-stage at the Cobb Energy Performing Arts Centre and Live GPB Broadcast. Performer – Sugarland, Jennifer Nettles and Kristian Bush: From the Platinum-selling #1 hit “Stay,” 22 million worldwide sales of albums and singles and five Country Music “Vocal Duo of the Year” Awards to Grammy and Academy of Country Music accolades, the duet partners combine vocal, songwriting, production and multi-instrumentalist greatness. Non-Performer – Alex Hodges: A native Georgian, Alex Hodges is CEO of Nederlander Concerts and started his career as an agent at Walden Artists where he introduced Georgia’s Otis Redding and other R&B legends to the world. As principal at Paragon Agency and later Empire Agency, he guided the illustrious careers of stars including Stevie Ray Vaughan, Gregg Allman and groups such as Lynyrd Skynyrd. The Police, The Allmann Brothers Band, Atlanta Rhythm Section, The Outlaws, Sea Level, The Marshall Tucker Band and The Charlie Daniels Band, among others. Songwriter – Gary Rossington: A founding member of the legendary band Lynyrd Skynyrd, Gary Rossington has contributed to the group’s 30 million+ worldwide album sales, three 2x Platinum records and a position among the 100 Greatest Artists of All Time by Rolling Stone magazine. He has created songs that implant him as a cultural icon, including “Sweet Home Alabama,” “Simple Man” and “Tuesdays Gone” among many others. Horizon Award – Riley Biederer: Riley Biederer is a singer/songwriter from Atlanta, USA, with a voice bigger than her ex-gymnast’s frame and a resume beyond her sixteen years. Since winning Georgia state titles in the vault and the floor exercise, she has been focusing exclusively on her music. In addition to writing prodigiously on her own, she has collaborated with a host of well-known songwriters in the pop, rock and country genres, and recorded with producer/engineer Matt Still. (Elton John, Outkast). She is currently writing and recording songs for her debut album. Posthumous: Blues guitarist Jonny Jenkins, Fox Theatre’s organist and WSB personality Bob Van Camp and Atlanta’s beloved DJ Skinny Bobby Harper. About Friends of Georgia Music Festival, Inc.
Friends of Georgia Music Festival, Inc. has been keeping the arts alive in Georgia communities by recognizing and promoting artists and the music industry for the past 34 years. Friends of Georgia Music Festival, Inc. is a non-profit organization that honors the many achievements of Georgia musicians, songwriters, composers, conductors, publishers and agents. Each year, Friends of Georgia Music nominates, elects and inducts honorees into the Georgia Music Hall of Fame, celebrating individuals who have made a significant contribution to Georgia’s musical traditions.